Work experience programmes to help get the unemployed back into regular jobs have a long and somewhat chequered past. They have two distinct and offsetting effects; first the work experience itself is valuable. It gives an opportunity for the unemployed person to signal good work habits, including turning up on time and self-motivation when at work. These are the basics that employers want, after skills and experience. A decent reference from another employer is a big plus when looking for work. Obviously this is more important for those who have been out of work for a long time, or for young people with little previous work experience. However, whilst a person is on a work experience programme job search activity diminishes. The participant is working which simply reduces time available, but it is as important that they focus on trying to impress the firm they are based in, in the hope of being kept on. This is called ‘Lock In’ in the jargon of such schemes. These two effects are clearly visible in the Figure below (taken from the CESI website http://www.cesi.org.uk/blog/2012/mar/work-experience-more-be-done). 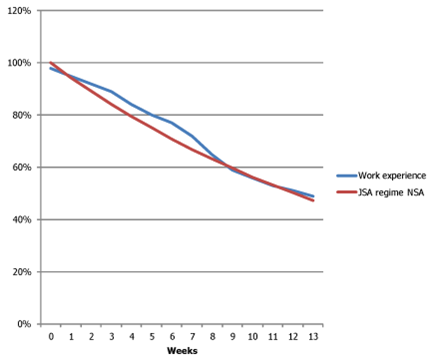 It shows the proportion of participants in the government’s current Work Experience programme who are still claiming benefits week by week once they start participating (the blue line), compared with those who do not participate (the red line). For the duration of the placement, the first eight weeks, the proportion still claiming is higher by about 5% and then they rapidly catch up. So whilst they are on the experience programme job entry falls but once it has ended the positive effects start to kick in. In this comparison the net effect is zero. This doesn’t definitively suggest that the programme has no beneficial effects for those participating, as we can’t be certain that those joining are not those who would have found securing work harder. They could of course be the more keen participants, or those in places where more firms offer placements, we simply can’t tell. However, this story of ambiguous effects with little overall impact on people’s chances of securing jobs has been the norm of Work Experience programmes since the 1970s. Unless, the design actively tries to minimise the adverse effects on job search and maximise the positive part of the work experience. The first key ingredient is to maintain and support job search throughout the placement. That means requiring and monitoring the participant’s job search activity, as is the case when people are on unemployment benefits. Furthermore, the support services that welfare to work providers deliver to the long-term unemployed, such as CV writing and job interview techniques need to be in place to make the most of the experience. Finally, the agents delivering the placement, both the provider and the firm, need to care about the person getting a job after the placement. The easiest way to guarantee this is a bonus payment if the person is kept on by the firm or another job is found shortly after completing the placement. Small firms especially have a lot of contacts they can use to help place someone. Hence it is generally most valuable for private or third sector firms to house the participant rather than in the public sector. Labour’s New Deal programme launched a decade ago now, had some of these ingredients but in sequence rather than all at the same time. There was a Gateway phase before the placement for support and intense job search, and again at the end in a Follow-through phase, but not when actually on the experience part. However, it didn’t have any outcome related payment for firms or charities providing the experience. By comparing those aged 24 who joined the scheme at 6 months, with those aged 25 who had to wait until 1 year, we got a sense of its effectiveness. A study by John van Reenen (LSE) showed clear job entry gains for participants, although it didn’t assess how long the gains lasted as the older group also joined the programme. The current Work Experience programme for under 25s starts much earlier at just 3 months, which means there are more potential participants and many more will find work quickly without help. For this reason the government is keeping costs down to a minimum. The placements are not paid and no support services are provided, no job search monitoring is in place and there are no bonus payments for firms who take participants on. Hence it should be no surprise that the scheme appears to be making little or no difference. Labour has just launched its ideas for a more intensive, 6 month paid programme starting after 12 months on unemployment benefits. These are a much smaller group with much greater need; people who go on to have very damaged working lives well in to their 40s unless they can get attached to long-term stable employment. With signs of intelligent design, the programme has all the key ingredients for making a difference, except outcome payments for the firms. Participants will have a support service provider whilst on the programme who is only paid on the basis of getting the person into work, the work experience is part-time to leave time for job search and as when receiving benefits normally, active job search is monitored and sanctions will apply if it is not undertaken. So the scheme has a decent chance of making a sufficient difference to cover its costs. But the other issue, apart from there being no bonus payment to firms getting participants into work, is that it is drawn very narrowly. By requiring a person to be on unemployment benefits for as long as a year means that many cycling between short term jobs and unemployment are missed. Those leaving school at age 16 or 17 who don’t get work are not entitled to benefits, and will still have to wait a year (until they are 19) before help kicks in. There is also no help for the 16 and 17 year old unemployed. So, it is a good first instalment but more will be needed to end long-term youth unemployment. In 2008 the previous Labour government introduced a new benefit for the sick and disabled called the Employment Support Allowance (ESA). The new benefit replaced two existing benefits for new claims on its introduction but at its heart were two major differences. First, was a new test called the Work Capability Assessment (WCA), to determine eligibility for the benefit and for the majority of claimants, called the Work Related Activity Group (WRAG) there was to be a new regime of personalised support and engagement to help people back to work (which I designed). The new regime initially applied only to new claimants but this week existing claimants are starting to be re-tested under the new WCA test and may potentially be reclassified as Fit for Work. There are two major reasons why getting this transition process right is critical. First, this is a large and vulnerable group and thus the introduction of the new benefit eligibility test has the potential to cause huge anxiety and distress to people. Many, especially those with mental health problems, may well fall into the sizable crack between ESA and JSA (unemployment benefit) and end up destitute, homeless or worse. Second, those denied access to the benefit are likely to end up on unemployment benefits which are not designed to help sick people back to work. Under the new Work Programme providers are paid to get claimants into sustained work are divided into three groups, the first are mainly adult unemployed who receive help after 12 months claiming benefits. Here the payment to a provider for getting them into work for a year will be of the order of £3500. Those “being found fit for work” and hence signing on as unemployed rather than disabled will normally be allocated to this group, although if they were previously claiming Incapacity Benefit they will get the help after 3 months. For those on ESA the package of support starts immediately and providers will be paid about £14,000 if they get someone into work for two years. Getting the sick and disabled in the right category thus matters greatly in terms of the chances of helping them into work. Those on unemployment benefits with significant barriers to work may well be ignored by providers as offering little hope of a pay off given the high investment needed to get them back to work. Given the imperative of getting people into the right category, common sense would suggest the Government should move slowly and check at each stage that any changes were working. So starting with new claimants makes sense and a five year review process was specified in the original legislation I believe. Yet the developments so far have been deeply flawed. Concerns with the WCA test emerged in late 2009/early 2010 with strong reports of major problems, especially around individuals with cancer, mental health problems and variable conditions. It also emerged that a huge number of cases were going to appeal, jamming the system, and often being overturned. The Government responded with changes to address these issues, but there were no subsequent checks that the problems had been dealt with. In fact, the cries of anguish continued unabated. In the summer of 2010, Prof. Malcolm Harrington was commissioned to undertake the first major review and it was quickly apparent that he saw the need for extensive changes to the process of the decision making after the test was undertaken. Furthermore, the DWP was also internally reviewing the medical test. Yet the first trial of the WCA test on existing disability claimants went ahead in Burnley and Aberdeen on the old test and the old decision process. So now as the medical test goes national the new regime outlined by Harrington and the DWP internal review is being implemented with no prior testing. The Government claims these changes have fixed the earlier problem and undoubtedly the Harrington Review will have made a difference, but surely it should be tested and checked before being applied nationally. It is baffling why the trials in Burnley and Aberdeen were not delayed just 4 months to test run the new regime. Likewise it is clearly essential to track the progress of those denied access to the new benefit, especially among those previously claiming Incapacity Benefits, to study what is happening to them. Are they moving to JSA, getting jobs or suffering acute deprivation without any financial support? By tracking people according to what conditions they are presenting with, we can assess which conditions are not being picked up well, if groups fail to move into work. But again no such research or tracking is apparently being undertaken. The process seems to have been characterised by undue haste, a lack of testing and immediate assessment. It may be that this derives from a view that those denied benefit will be healthy and undeserving of support, rather than emphasising the risk of vulnerable people being treated inappropriately. This has become an interactive process of changes being followed by a chorus of complaints, revision, a wait to see if complaints diminish, and further revision when they don’t. The current national roll out will not be the end regime but just the latest iteration in my view. This is no way to introduce such a fundamental reform affecting so many vulnerable people. The Work Programme is the Government’s replacement for Labour’s Flexible New Deal which in turn was preceded by various New Deal programmes. The new programme will have three new features which are distinctive and potentially positive. First, it will operate a single programme for multiple client groups but with three different major fee rates. Providers running the programme will receive fees for helping clients into sustained work with the regular adult unemployed forming the bulk of the cheapest group. The young unemployed are the main group in the middle tier and those with significant disabilities forming the most expensive tier. This step has been planned for some time with the move to Employment Support Allowance replacing Incapacity Benefits and the development of a welfare to work strategy for the disabled. However, this integration is the first time that the UK has operated a clear unified programme which offers real hope of reducing long-term marginalisation of this group from the labour market. The second major advance is that the full payment to providers for getting people into work will not be paid until a person has been in work for a year rather than 6 months, and two years for the sick and disabled. This will encourage providers to think more about job matching and indeed job quality as better paid permanent jobs have a far greater likelihood of paying out. Third, the programme is fully “black box”: there is no prescribed provision or minimum service agreement. This will facilitate use of new group/team based working rather than one-to-one fortnightly meets which dominated the minimum service agreements and are probably poor value for time and resources. Team or group based working has a good history of helping through peer support as well as being low cost. What is missing, in my view, is discussion of a number of issues which have not been dealt with previously, and a couple which are particular to the new programme. For young people, even though youth unemployment is high, very few NEETs will be on the Work Programme. Only around half of 18-24 year olds not in work or education are signing on for Job Seekers Allowance and only a minority of these have a single spell of claiming that is sufficiently long to join the Programme. Hence most will miss treatment because they get spells of short term work or training or don’t sign on. In terms of benefits spending this may appear acceptable, but we know that these individuals who fail to connect to sustained work go on to have very poor earnings and frequent spells of unemployment when older. A window based on the person’s recent history of worklessness is necessary for entry to the programme, rather than single spell duration and those not on JSA need to be identified and tracked to facilitate re-engagement. A further long standing problem is that DWP contracts on a fixed price for all those in a group. The risk is that the provider will focus on the easiest to help and not invest in the hardest. This is sometimes called parking; parking is likely to occur within the three group bands, although there are small extra payments for some groups within bands but is probably most problematic among the disabled where the huge variation in conditions and costs associated with getting them back to work may mean many are written off as too costly to help. The fees on offer are tight for providers and the poor labour market conditions will mean providers will struggle to match cost. In many cases winning the current contracts may well prove to be loss leaders until the next round of contracts. This means DWP may be getting very good value right now but there has to be a risk that some providers may withdraw or need contract top ups to keep going, as happened in Holland when this structure was introduced in the 1990s. Further details of the new Universal Credit were recently announced, with much fanfare. The plans integrate a number of different benefits and tax credits into one system which will make transitions in and out work administratively easier for claimants. The new system also makes taking mini-jobs (<16 hours) far more attractive, both to those out of work and to those currently working 16 to 20 hours in order to be eligible for the in-work tax credits introduced by Gordon Brown. When Ian Duncan Smith first discussed the need for reform he also highlighted the very high effective tax rates people face when earning more. We all pay income taxes on extra earnings but tax credits and the new Universal Credit are also withdrawn, leading to high effective tax rates. The details show what will happen to these effective tax rates under the new system and compares to what it calls the current system. The current system will apply from April this year, which is important because the new government increased these effective tax rates in their first budget. The table below shows the figures announced today in the final two columns. It shows how the new regime will reduce the numbers of people with effective tax rates over 80%, but increase the numbers facing 70% to 80% tax rates. It will also increase the numbers facing 60-70% tax rates; this is people just on Universal Credit. Overall there is an increase of half a million people facing effective tax rates at 65% or over. But this excludes the effects of the budget earlier this year and in the first two columns I report the numbers produced by HM Treasury at the time. They are not quite identical for the ‘current’ system for reasons that are not clear. But the point here is that this budget sharply increased the numbers facing tax rates between 70 and 80%, though to be fair this was mostly a move from 70% to 72 or 73%. But the point is that despite earlier statements from Ian Duncan Smith, the numbers facing punitive tax rates will have risen by 300,000 under this government and the normal tax rate for these people will have moved from 70 to 76%. As such the new regime encourages people to work a little bit, but reduces the incentive for people to work more. The latest proposed spending cutbacks, announced today, are restrictions on the amount of money that can be paid tax-free into a personal pension each year – from £255,000 to £40,000 – and on the amount that can be built up in employer pensions. While this will be unpopular with the pensions industry, this proposal has a lot to recommend it. There is a strong reason for the government to provide some incentives for people to save in a personal pension. Without tax advantages it is not an attractive form of saving because of its inflexibility – in the UK the money is locked away until retirement and then most of it has to be converted into an annuity (an annual income). This is exactly what the government wants people to do to prevent them from blowing their savings before or after retirement and falling back on the state – as apparently happens in countries such as Australia where annuitization is not compulsory. But without giving extra tax privileges, it is not clear that anyone would choose to save in this way. Following this argument, however, the “right” level of incentives will ensure that people build up a pot big enough to keep them off means-tested benefits (with a bit on top so they feel that the sacrifice has been worth it). There is no particularly strong economic reason to subsidize pensions above this level and allowing people to pay such huge sums tax free into a pension each year favours the better off. Whether £40,000 is the right limit is harder to say. Means-tested benefits (pension credit) are currently worth £132.60 a week for a single person. You need a pension pot of more than £200,000 to get an annuity that will pay you this amount (for a woman aged 60 buying a single life annuity linked to inflation) – although this is an upper limit since most people will have some state pension that reduces the amount of means-tested benefit they receive. If people contribute to a pension during most of their working lives, the annual limit of £40,000 seems more than enough to reach this level of savings. There may be some, however, who were planning to concentrate their savings in a few good years who will be hard hit. More flexibility in being able to smooth contributions over years would help them. However, it is less clear that the proposal will generate the type of savings that are currently being talked about – £4 billion a year in the cost of tax relief. These estimates typically assume that the money would otherwise be saved in a fully taxed form of saving – such as regular holdings of stocks and shares or a bank or building society account. This is clearly not the right counterfactual; wealthy savers will be seeking the advice of financial experts on the next best alternative to reduce the amount of tax that they have to pay.